Nothing is more Aussie than helping a mate, and that’s what a group of inspiring Victorians did on Australia Day. Led by kidney recipient Brooke Huuskes, Chair of the Transplant Australia Victorian Committee, 25 people whose lives have been saved by organ and tissue donation marched in the Victorian Australian Day Parade to promote the call to action: Australia, we need more people to join the Australian Organ Donor Register at donatelife.com.au. Brooke’s fellow marchers included heart, kidney, lung, liver and cornea recipients. They’ve stared death in the face, and come out the other side thanks to the generosity of organ donors, and their families. Now, they want to say ‘thank you’ by paying it forward. Living donors and donor families also walked with Transplant Australia. In eye-catching orange shirts, they definitely stood out at the 2018 Australia Day Parade. The group is driven to help other Australians the same way they have been helped. Organ donation has meant that Brooke has been able to complete her PhD in kidney regeneration; travel the world, represent Australia at the World Transplant Games (the equivalent of the Olympics for transplant recipients), fall in love; basically, to live an incredibly active and fulfilling life. The 33-year-old from Glen Iris wants to make sure that other Australians who need a transplant are given that chance. At any one time, there are 1400 Aussies on the waiting list, their lives on hold or in danger, a transplant their only hope. Many more Australians are at risk of one day finding themselves on the waiting list due to organ failure. According to statistics from the Victorian Government, in 2014 there were close to 23,000 Australians who were receiving dialysis treatment or living with a kidney transplant to treat kidney failure. Brooke is optimistic that the Australia Day March is the perfect place to celebrate helping a mate through organ and tissue donation. 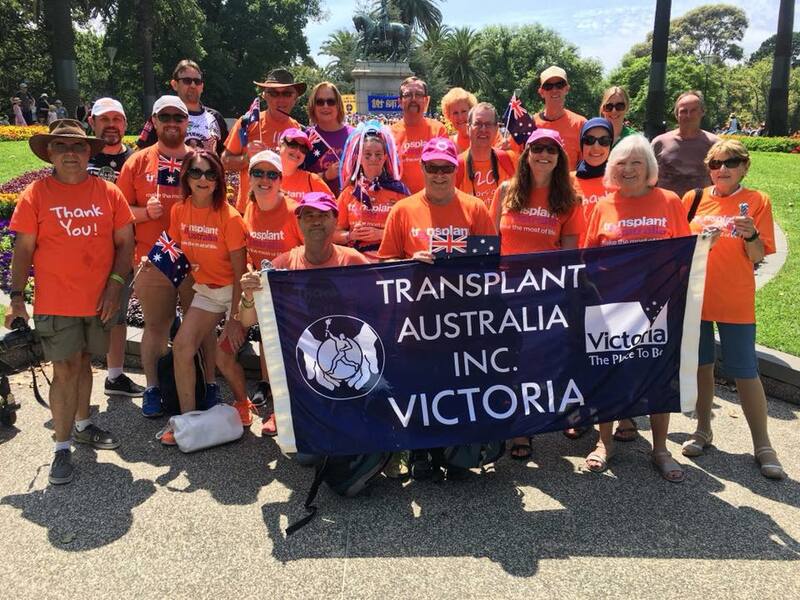 Transplant Australia CEO, Chris Thomas, says, “We are very proud of the members of the Transplant Australia Victorian Committee for taking part in this march, demonstrating living proof that transplantation saves lives. “Transplantation allows recipients a quality of life they might not have experienced for years. They can start a family, get back into the workforce – all because of the generosity of someone else,” Mr Thomas said. The message to all Australians is to register as an organ and tissue donor. “For every Australian willing to one day save lives, joining the register is the clearest message a person can give their family that, in the event of their death, they have made a decision to leave a legacy of donation to save the lives of other Australians,” Mr Thomas said. Transplant Australia congratulates Alan Dean Chrystie, Terry Holyoak, Martina Mc Ardle, Ken Pedlow, Anna Modlin, Frankie Simovic, Kylie Ann Chappell, Darren Hennessey, Nigel Goldsworthy, Robyn and Mark Dinnar, Roxanne Kavanagh, Dave Howard and the others who marched on Australia Day.